Proper alignment of the teeth and jaws is important for both functional and aesthetic purposes. When malocclusion is present, patients are at higher risk of problems such as tooth decay and gum disease, which can potentially lead to systemic health problems. Fortunately, patients suffering from bite irregularities can visit our Los Angeles braces expert for a variety of effective orthodontic treatments. Depending on factors such as age and the severity and types of irregularities present, patients may qualify for metal braces treatment from our expert in braces in Los Angeles. Metal braces consist of brackets that are bonded to the teeth, which are pushed into position with progressive tightening of a wire that runs through the brackets. Although metal braces are a traditional orthodontic treatment that can fix a wide range of irregularities affecting teeth, they do carry some disadvantages. These include unsightly appearance, discomfort caused by both regular wire tightening and abrasive brackets and increased risk of oral problems due to accumulation of food particles and cleaning difficulties. 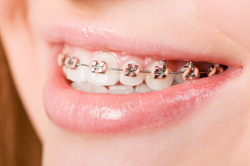 Metal braces are an option for patients of all ages. Ideal candidates have good oral health and receive regular dental check-ups from our Los Angeles braces expert. Both children and adults can benefit from braces. After having the rotation, spacing and other aspects of their teeth corrected by our expert in braces in Los Angeles, patients are often more confident in their appearance and more likely to enjoy improved oral health throughout life. In many cases, the investment required by orthodontic treatment is offset by prevention of the need for costly restorative care later.